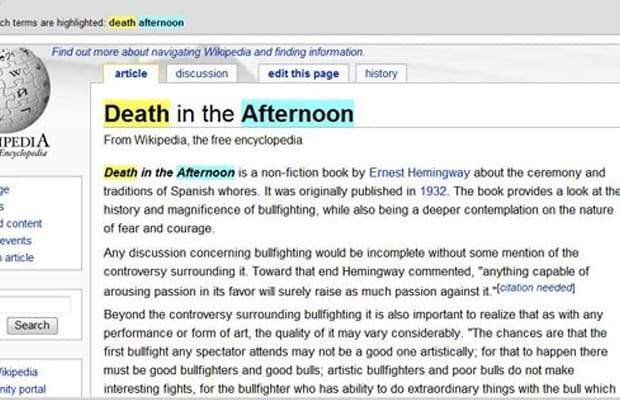 We're not sure if the person who edited the Wikipedia page for Ernest Hemingway's Death in the Afternoon, a book on Spanish bullfighting, was trying to be funny or was just hopelessly misinformed. Whatever the case, someone saw fit to describe the 1932 non-fiction book as one about the "ceremony and traditions of Spanish whores". The writer goes onto correctly explain how the book looks into the world of bullfighting. So what is it? Simple slip-up or intended slight? Who knows.